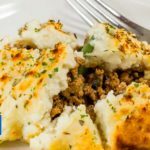 #1 Keto Cottage Pie Recipe - Low-Carb "Cauliflower Mash & Hearty Beef" EASY Homemade! Our Keto Cottage Pie is a comforting all-in-one dish, topped with buttery cauliflower mash. It is even better reheated for lunch the next day. Add the olive oil, garlic, oregano, onion and celery and saute for 5 minutes, until the onion is starting to become translucent. Add the salt and ground beef, stirring continuously to break apart the meat while it browns. When the beef is browned add the tomato paste and stir well. Add the beef stock and red wine vinegar and simmer uncovered for 20 minutes until the liquid has reduced. Add the thyme and green beans and simmer for 5 minutes before removing from the heat. 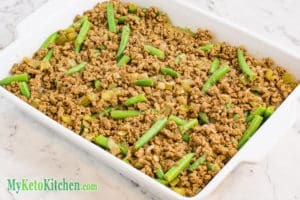 Spoon the beef mixture into your casserole dish and set aside. Fill a large saucepan two-thirds full of water and bring to the boil. Add the cauliflower and cook for 7-10 minutes until tender. Carefully pour the water and cauliflower into a colander and drain well. Return the drained cauliflower to the saucepan, along with the butter, salt and pepper. Using your stick blender, blend the cauliflower into a smooth mash. Gently spoon the mashed cauliflower onto the beef mixture in your casserole dish. Sprinkle with paprika and oregano. Bake the pie in the oven for 25-30 minutes, until the mash is golden brown. Serve immediately or chill and store in the fridge for up to 1 week.